When Shooting Sportsman launched in 1987 and experienced its initial growth into the early ’90s, the magazine’s rise rode two powerful trends in shotgunning: growing appreciation for better double guns and enthusiasm for the latest clay-target discipline: sporting clays. The earlier, more casual “hunters’ clays” format was by then becoming the formal and competitive sporting clays we know today, with dozens of major competitions every year and top shooters whose consistent feats of skill and competitive grit have earned them true “pro” status and busy coaching schedules. While many Shooting Sportsman readers are diehard sporting clays competitors and many more shoot at least a few rounds of sporting a year, we don’t devote much attention to the upper end of the competitive sport. Other magazines cover competition exclusively, while our focus has remained on sporting clays as more “gentlemanly” recreation: year-’round practice for game shooting and competitions featuring the guns that many readers collect and carry afield during hunting season. But we thought that a glimpse into the world of top clays shooters might offer some insight regarding their guns and shooting methods that could benefit aspiring competitors and the “weekend warriors” among us. In talking with them and considering the specs of their gun setups we found plenty of consistency—and a few surprises. • Flat ribs, tiny beads and a low-gun approach. The change allowing pre-mounted shooting in competition scandalized traditionalists and still separates some “vintage”-type shoots from the contemporary sport. But it’s not much of an issue to these guys: From high stocks to flat ribs, they are set up for adapting their low-mount guns to the occasional targets shot better from a pre-mount. One reason is that they shoot the same guns for the international variant FITASC, where low-mount is still the rule. So here they are—seven guns from seven makers, set up for seven top shooters who will campaign them at the highest level of sporting clays this year. Choke: Rhino extended chokes. The weight balances my gun perfectly and they pattern great. Balance point & adjustability: Balances at hinge pin. What are the top three attributes you look for in a sporting clays gun? 1) Trigger, 2) barrels, 3) how well it points. The rest I can customize. Zoli has the best trigger and points great. They put a lot of research into ballistics—it would be hard to find a better barrel. What led you to choose the guns you shoot now? I chose Zoli because I felt like it’s the best and the support from Zoli USA and International is unbelievable. They really go the extra mile to take care of their customers. That simple. Describe the customizations made to your gun. Custom stock. Rhino chokes. Mid-bead removed and put on the end. That’s it. Do you like nice engraving and wood in a competition gun, or is your gun a purely utilitarian tool? I have beautiful engraving and wood and like having a nice gun, but it hasn’t always been that way. For years I shot stocks that I carved with Bondo and tape, etc. At the end of the day it’s about how it shoots—that’s what really matters. Name something about your current gun that people wouldn’t know or expect. Zoli built the gun as a present commemorating my national championship in 2010. It’s got some special engraving referencing the win. How many rounds do you fire in a typical month or year? I used to shoot a lot more—40,000 rounds a year. I’m shooting a lot less now. But Zolis can handle whatever number you want to run through them. Do you ever use your competition gun in the field? If so, for what type of hunting or shooting? I have used it in the field. I usually don’t, but I didn’t bring a hunting gun to Florida on vacation this Christmas and used it for wood ducks with my brother and our kids. 1) Balance, 2) pointability, 3) gun fit! I’ve shot Guerini for four years, and this is a new fixed-choke model, as I rarely ever change chokes. This gun balances so well without the weight of the multi choke. Custom stock, everything else is standard. Yes, I like a pretty gun. This is the first fixed-choke competition model from Guerini. About 20,000 to 30,000 per year. Yes, I use my old competition guns: a pair of Ellipse Evo RF1s if I’m double-gunning on game, or just my new Invictus V if I’m only using one gun. Balance point & adjustability: 1/4″ in front of hinge pin with no adjustability. 1) Balance and feel, 2) pointability, 3) durability and low recoil. I feel Perazzi builds the best gun in the world with the best combination of speed, pointability and durability. Each gun is built custom to your specifications. They are the only company that offers truly custom competition guns. I shoot it right out of the box. If Perazzi builds you a gun, there are no alterations to be made. For my taste the Perazzi MX2000 has the right blend of engraving and wood. Name something about your current gun(s) that people wouldn’t know or expect. I use it on doves and pigeons. Rib: Fixed-ramp tapered rib with small mid-bead moved to the end. Patterning point: Standard point of impact. Can be adjusted by a Kolar gunsmith. Balance point & adjustability: Just behind the hinge pin, only adjustable using weighted tape. Trigger: 3 1/4 pounds pull, mechanical. The first thing I look for is feel: If the gun doesn’t feel good when you first pick it up, it takes a lot of work to get the gun to feel right. Feel includes balance and how the gun swings along with fit, although fit is the easiest thing to correct. The second thing I look for is trigger pull: The weight of the trigger can be adjusted by a good gunsmith, but a clean, crisp break of the trigger is harder to achieve. The Kolar had both right out of the box. The third thing is recoil. There are things that can be done to help soften recoil, but if your gun kicks when you first get it, it’s harder to get the recoil under control with gun fit and other reduction devices. The gun was extremely fast to the target without putting a lot of effort into it. Second, the Kolar Max Lite is the softest-shooting over/under I have ever used, and the people at Kolar are some of the nicest, most helpful, in the business. The only things I have done are get a custom-fit stock from Wenig Custom Gunstocks, replaced the white bead with a small mid-bead, and had the barrels ported. I enjoy shooting a pretty gun. It’s important to think your gun looks good—it gives you a little extra confidence. I prefer a hard, clear finish similar to what Kolar and Wenig use, because it seems to be more durable. My gun is set up to shoot a little higher than most, mostly because I want to be able to see what I’m shooting at. 1,500 to 2,500 per month, depending on how many big shoots there are. The only time I use my competition gun in the field is for a European-style driven shoot. Other than that it isn’t very practical for most hunting applications. Stock: Standard Blaser stock lengthened to 15.5″, Schnabel forearm. Patterning point: I have my POI at 50/50 as I shoot the flat rib; non-adjustable. Choke: Briley Titanium sinoid chokes, both Improved Modified. Balance point & adjustability: A tad barrel-heavy to aid in a smoother swing. Trigger: 3.3-pound pull, mechanical striker fire system. 1) Balance and feel, 2) looks—the physical aesthetics, 3) how the gun recoils. Blaser provides a gun that is perfectly engineered in Germany. I have put 100,000 rounds through it without one malfunction. The pointability is second to none. It is unlike any other product in the competitive market. The only change is that it was lengthened from the stock 14.5” length of pull to my 15.5”. I am a firm believer in the saying “You have to look good to be good.” Blaser offers an endless amount of different engravings, so there is never an excuse to shoot a standard blue receiver. The beauty of our upgraded engraving and wood is that the guns will operate just as perfect as the standard package. You don’t lose any functionality. No one ever believes that the stock dimensions provided by Blaser fit me to a “T.” Most competitors have custom dimensions—that wasn’t necessary for me. I typically shoot 25,000 to 30,000 rounds a year—usually 5,000 to 8,000 in competition and the rest in practice or on the field. Rarely, the only exception would be on a dove field. Stock: Custom stock by Jim Greenwood, longer, with a higher/straighter comb. Rib: Standard Parcours rib, 8mm wide tapering to 6mm; mid-bead removed and replaces front bead. Patterning point: Prints approximately 60/40. Choke: Fixed choke, set by Briley at Improved Modified in both barrels. Balance point & adjustability: Neutral balance. I used one factory barrel weight to achieve the balance I wanted. Trigger: 3 pounds on both barrels, mechanical triggers. 1) Dependability/durability, 2) fit, 3) pattern performance. I am at heart a low-gun shooter because of hunting and FITASC. I work best with guns in the 8- to 8.5-pound range with a neutral balance. Custom-fit stock by Jim Greenwood and barrel work performed by Briley to give me the long-range patterns I wanted. Both barrels are the same, so that I’m not distracted by deciding which barrel first in a pair. I love engraving and wood, but for my tournament gun standard-grade guns are fine. I do like custom-fitted guns, and if you are building a custom stock, it might as well be pretty wood as long as strength at the head of the stock is not sacrificed. I love hand-rubbed-oil finishes, but for a tournament gun a poly-based finish that seals the wood more effectively has advantages. The barrels are fixed choke and purposely choked exactly the same. 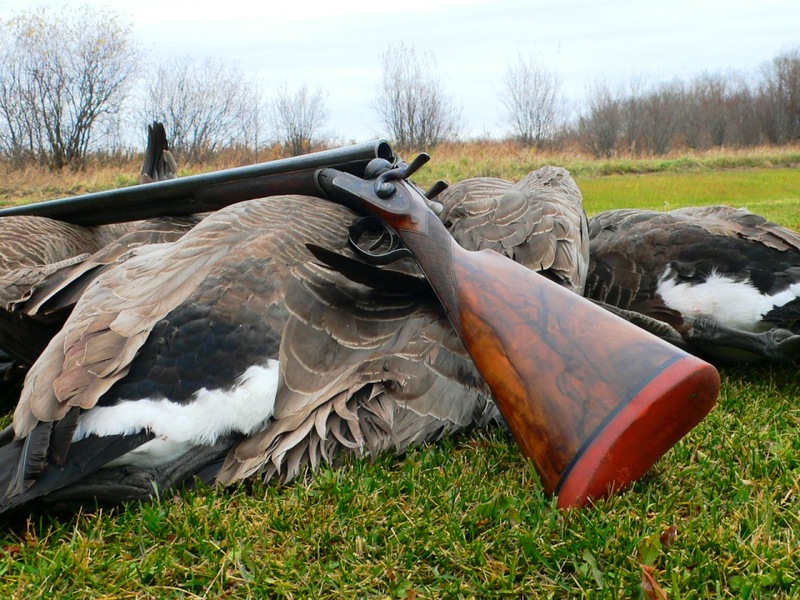 I use my Parcours hunting, especially with my 20-gauge barrels, quite a bit. It went to Argentina with me this year…20-gauge barrels for doves and 12-gauge barrels for pigeons. I’ve also used my sporting gun in the UK for driven birds quite a bit. I have on order a K-20 Parcours with 32” 28-gauge barrels for doves and quail. Weight: 8 pounds 15 ounces. Stock: Non-adjustable custom stock with 15.5” LOP, palm-swell grip; beavertail/custom forearm. Rib: 10x8mm tapered, non-adjustable rib with a very small mid-bead and the stock mid-bead used as a small end bead. Choke: Extended Briley Plasma Series chokes; lightweight to reduce barrel weight. Balance point & adjustability: Neutral and non-adjustable balance. Trigger: 3-pound custom-tuned detachable inertia trigger by Ed Anderson. Reliability is the most import aspect when I am looking at a competition shotgun. Then it comes down to overall feel and pointability. I have my stocks custom-built, so gun fit is a non-issue. I’ve shot Beretta shotguns my entire life, so the DT-11 was the obvious choice for me in an over/under model. Porting, hand-tuned trigger, custom stock made by Jim Greenwood of Kansas, Briley Plasma chokes. To me, my gun is a tool. I do have a very pretty wood stock, but it’s a tool first. I think that most of the world’s top shooters shoot a much higher comb than the average gun fitters suggest. In other words, seeing the entire rib is not a bad thing. I shoot about 25,000 rounds per year if I include both practice and competition. Yes, I will use my sporting gun for shooting high-flying driven pheasants. Be respectful of our online community and contribute to an engaging conversation. We reserve the right to remove impersonators or personal attacks, threats, profanity, or flat-out offensive comments. By posting here, you are permitting Down East Enterprise to edit and republish your comment in all media. It would be more interesting to learn what these guys shot early in their careers. I bet most put thousands of rounds through Miroku/Brwoning Citori guns. I can remember pictures of a young Digweed and a younger Faulds with Miroku guns.